Honolulu is the Capital of Hawaii on the island of Oahu and the most visited island. Home to Waikiki Beach and numerous beaches and coves along its shoreline. A visit to Oahu would not be complete with a stop at Pearl Harbor, the Polynesian Cultural Center, Diamond Head and some water activities. The Hawaiian Islands are certainly known as a romantic destination, long enjoyed by couples and perfect for destination weddings, honeymoons, anniversaries or vow renewals. Sharing your love while watching the sunset, or sitting beneath a secluded waterfall, taking in flowing lava from an active volcano, renting a convertible and driving around, or onboard a romantic dinner or cocktail cruise are all ways to enjoy the islands together. 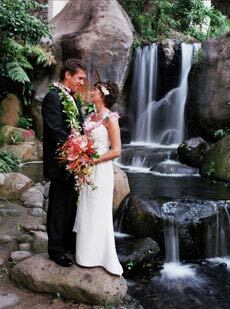 Marriage requirements in Hawaii are very easy and there are many on-site wedding coordinators to assist you in arranging your special day. Why not have a luau for your wedding reception? Talk about unique! The flower, food and scenery are sure to please you and your guests. Many resorts offer a complimentary honeymoon gift as well. We would be happy to help you with your Hawaiian dream vacation!